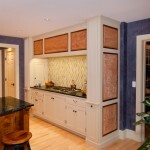 An island styled like a traditional 'harvest table' makes for a central gathering place in this kitchen. 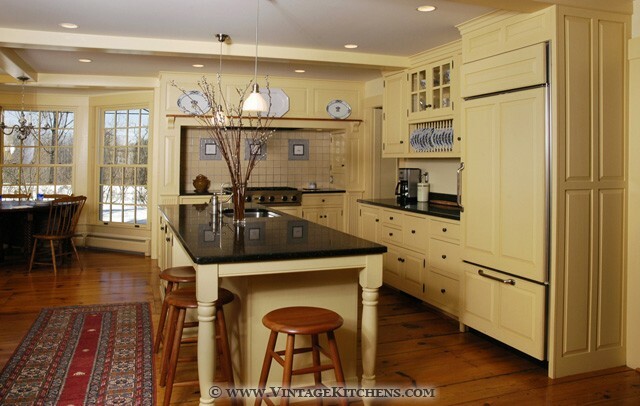 This milkpaint island features custom turnings inspired by other furniture in the house. 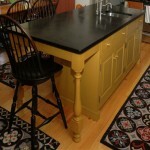 Table legs at the seating overhang lend a harvest-table look to the island. 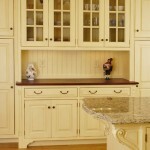 This built-in hutch features red birch with a cherry countertop, turnings and molding details. 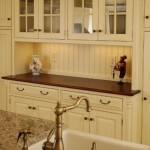 The marble-topped custom worktable style vanity is a good fit for this 18th Century Cape. 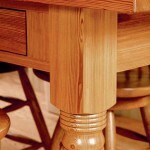 Wiring for an electrical outlet sneaks up inside one of the custom turned legs. 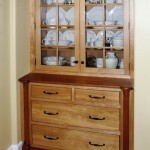 The figured mahogany hutch was built in our own Vintage Custom Cabinetry shop. 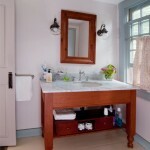 It features a delft tile backsplash and soapstone countertop. 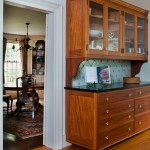 There are six Jeffrey Cooper carved panels in the mantel surround featuring different historical locations throughout New Hampshire. 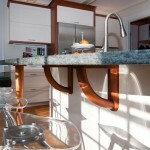 Even the countertop support brackets feature a contemporary curved tubular look; custom shaped in cherry by our own shop.